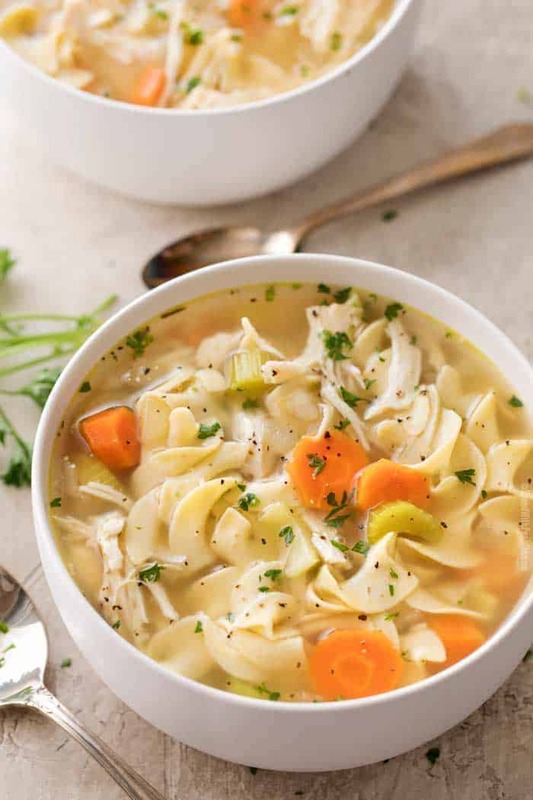 This Crockpot Chicken Noodle Soup is hearty and comforting, yet incredibly easy to make! 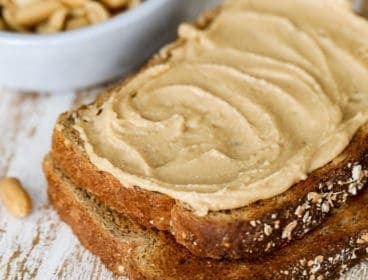 No need for a can of soup, homemade is the best! Is there anything more comforting than a big bowl of hearty soup? There’s something so natural about it, and it brings you right back to childhood. 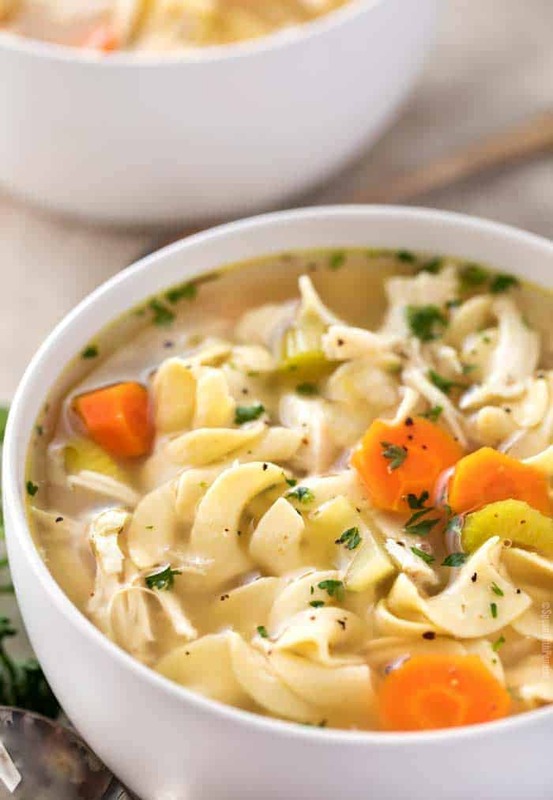 If the only chicken noodle soup you’ve ever had is a can of good ol’ Campbells, then simply put… you NEED to try a homemade version! 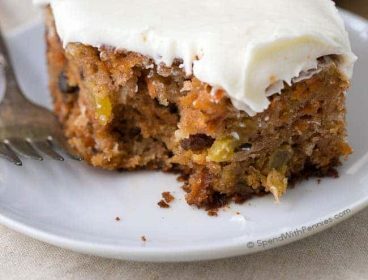 The flavor is so rich, so complex, and it’s incredibly easy to make at home. Normally I think of chicken noodle soup as “sick food”… something you eat when you’re under the weather. 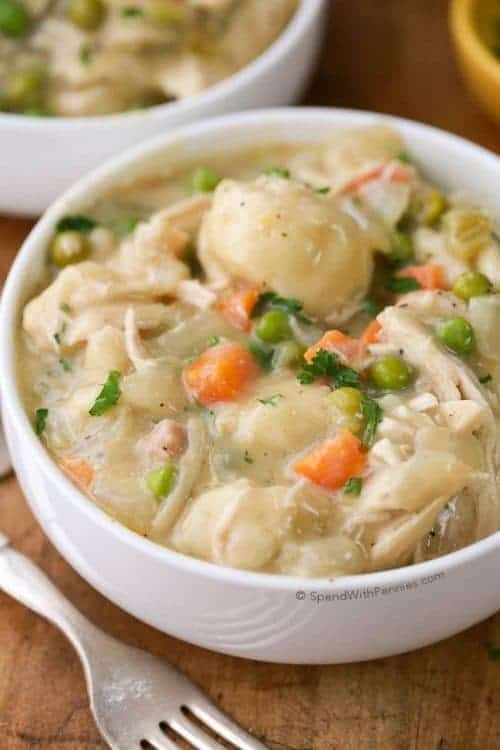 And don’t get me wrong, this easy crockpot chicken noodle soup recipe is FABULOUS for that, but it’s also fantastic on a night when you’re looking for some comfort food. 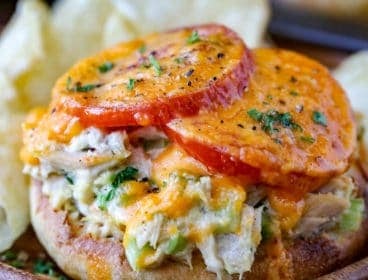 Paired with a green salad, it’s a great light meal as well! 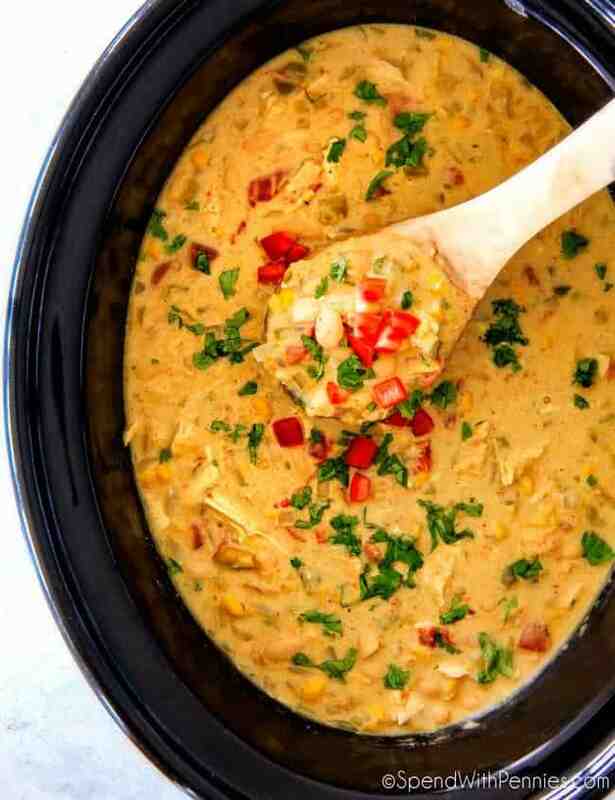 I love cooking soups in the slow cooker because it adds great flavor plus I love coming home to dinner ready to go. 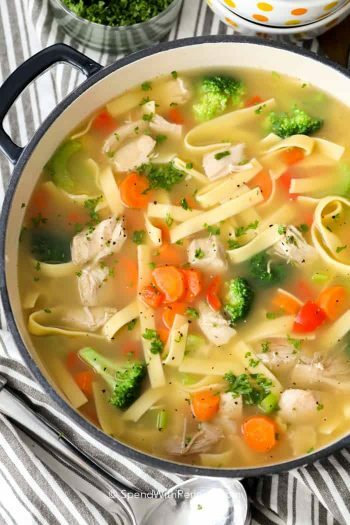 If you’re in a rush, I make an amazing stove top Chicken Noodle Soup in about 20 minutes too! It depends on the ingredients you use to make the soup, and when you use quality ingredients, yes! Plus the soups steam warms you and eases any congestion, and the warm brothy soup helps ease a sore throat. 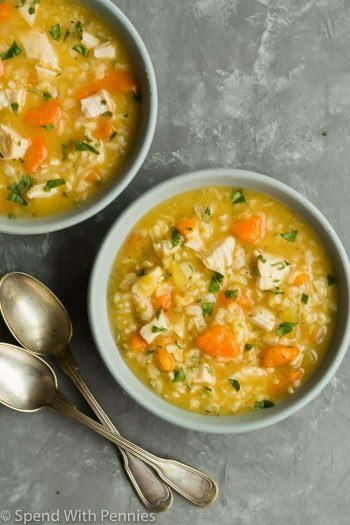 There’s a reason it’s the universal soup for when you’re under the weather! I also like to buy reduced sodium chicken broth, so I can control the amount of salt in the dish. If you’re wondering what are the best noodles for chicken noodle soup, I prefer to use wide egg noodles. They tend to keep their shape and texture in soup compared to other types of noodles. 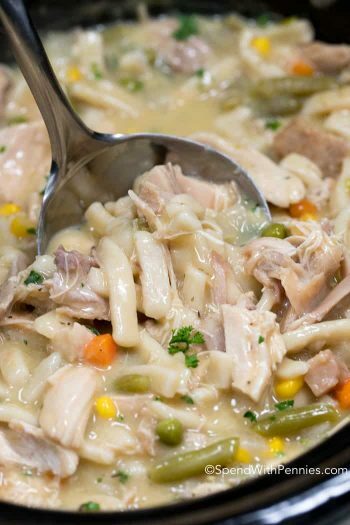 Some people make crockpot chicken noodle soup with rotisserie chicken, but this slow cooker chicken noodle soup makes it so easy to use fresh chicken. After a long, hard day, a big bowl of this soup is the cure! 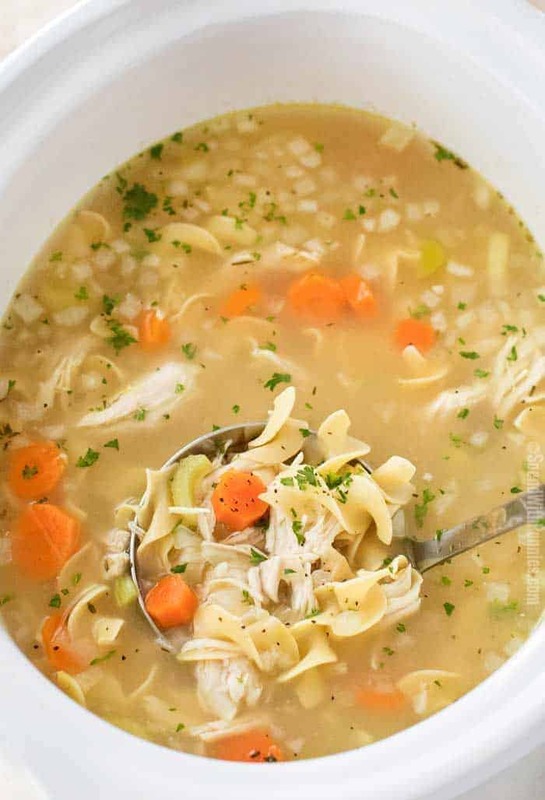 WHAT’S THE DIFFERENCE BETWEEN CHICKEN BROTH AND CHICKEN STOCK? Is there a difference between broth and stock? Yes, there is! Traditionally, chicken broth is made from simmering meat, whereas chicken stock is made from simmering bones. 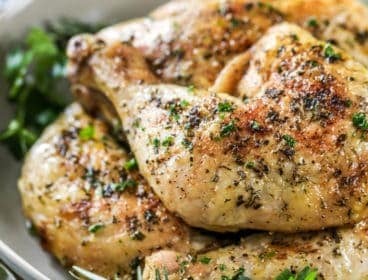 Chicken stock has a richer flavor, due to the gelatin released from the bones as they cook, and broth is much lighter, in color and mouth feel. 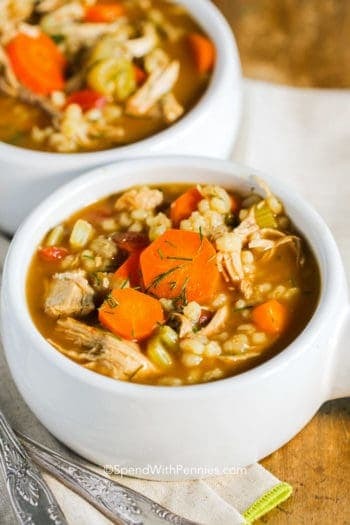 Since crockpot chicken and noodle soup is traditionally a brothy soup, with a relatively “clear” broth, I always use chicken broth instead of stock, but you can use whatever you prefer or have on hand. 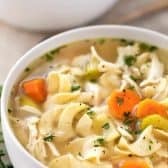 WHAT HERBS ARE USED IN CHICKEN NOODLE SOUP? In this, the best crockpot chicken noodle soup, I’ve used dried rosemary and thyme, with some fresh minced parsley as a garnish. Some dried tarragon, or using fresh herbs would be great additions and substitutions as well. While not exactly herbs, we’ve also used the classic “mirepoix” or “holy trinity” of diced onions, carrots and celery. These vegetables are used very frequently to start off just about any soup by adding amazing flavor and aromas. 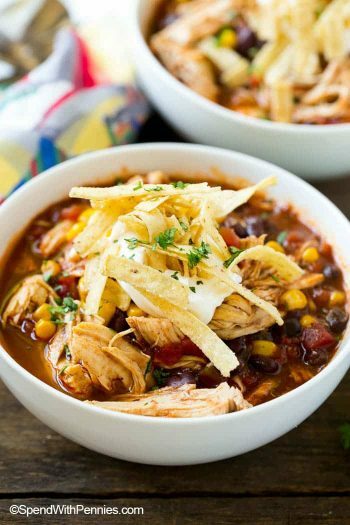 Looking for more fantastic soup recipes? Try my Copycat Olive Garden Zuppa Toscana, and hearty Slow Cooker Minestrone! 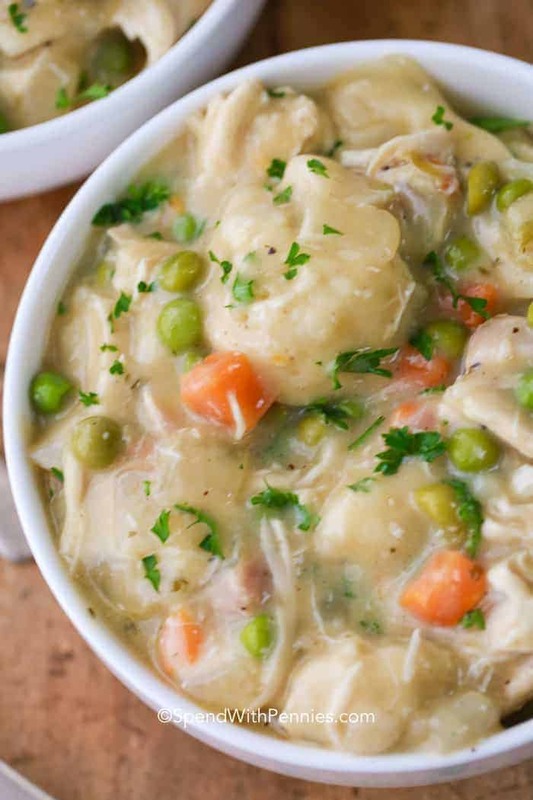 This crockpot chicken noodle soup is hearty and comforting, yet incredibly easy to make! To the bottom of a 6 quart or larger slow cooker, add trimmed chicken breasts. Top with onion, carrots, celery, garlic, dried thyme, dried rosemary, salt and pepper, and bay leaf (if using). Dollop chicken base over the top, then pour in chicken broth. Gently stir to combine. Cover and cook on LOW for 6-8 hours, or HIGH for 3-4 hours. 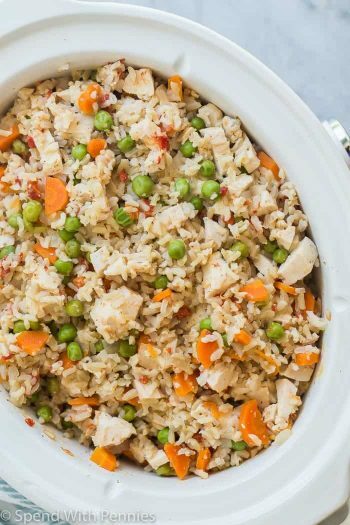 Remove chicken from slow cooker to a large mixing bowl. Shred chicken. Discard bay leaf (if using), and return shredded chicken back to slow cooker. Cook egg noodles al dente according to package directions. Add egg noodles to soup and cook on LOW for 5 minutes to allow flavors to blend. 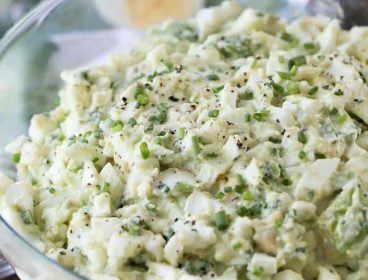 Serve garnished with minced fresh parsley and a sprinkle of black pepper. While this recipe originally had the noodles cook in the slow cooker, some brands did not work well. We strongly suggest cooking the pasta separately. Option to Cook Egg Noodles in Slow Cooker: Add raw egg noodles before serving, stir, then cover and cook on LOW for 10-15 minutes, until pasta is tender. 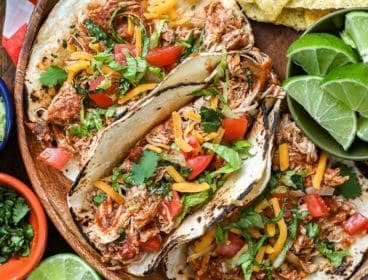 Amanda is the creator behind the food blog The Chunky Chef, where she shares comforting family meals, and the healthy food blog Smart Skinny Recipes, where she shares delicious family recipes that are on the lighter side. She firmly believes life is all about balance; eat a salad, but enjoy some bacon along with it! When she’s not in the kitchen, you’ll find her behind a camera, reading, and spending quality time with her husband and 2 children! You can visit her at The Chunky Chef and Smart Skinny Recipes!